Hello and welcome to the December edition of this monthly program. If you are joining in for the first time, 👏👏👏. First of all, ALL THANKS to the Almighty God for preserving our lives and that of our family and loved ones to see the end of November 2016. We bless him more for the opportunity to secure the month before we even start it. Thank God for this great insight indeed. I am amazed at the way God does his thing. I am full of praise and I am sure you are too. Father I thank you for the blessings of this concluding month and I also thank you for the blessings of the new month because it will overflow. 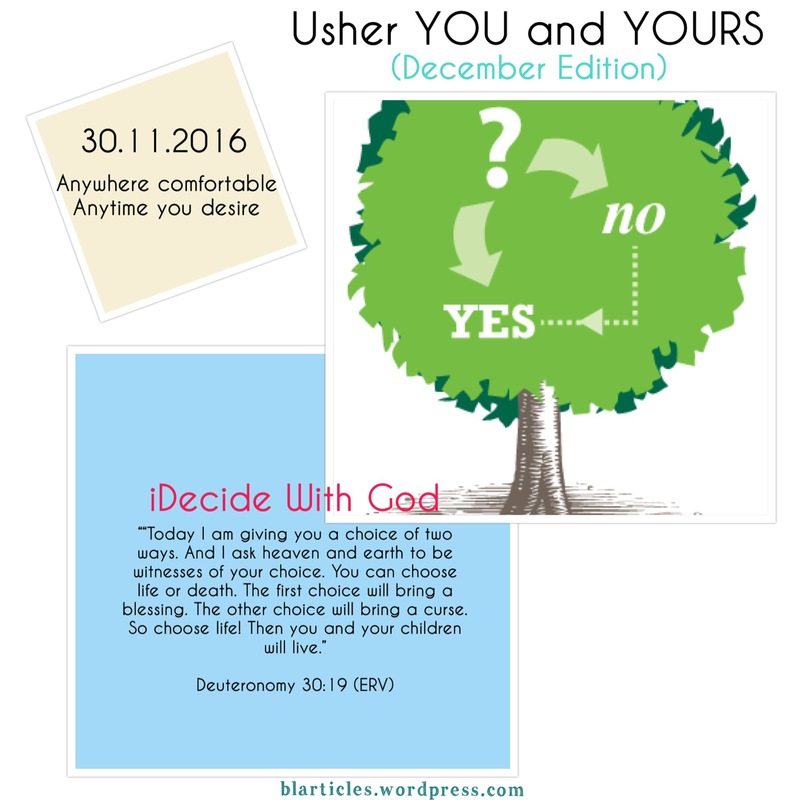 Father thank you for the power to choose. And today Lord I and my family choose Life and this we do because You are LIFE. We declare that your grace is sufficient for us and we will obey you and never leave you. Father, We choose to operate in this understanding in every area of our lives in this new month and beyond. Father we will live long and prosper because the land you have planted us in is fertile. Father in this new month. Every where I go, everything I come in contact with and every work I lay my hands ﻿to do; they all experience an aliveness because I have chosen Life and not just chosen it, I carry it in me. Amen. God bless you and Happy New Month. Prev Am I Shadow of Myself? Next Day 1: Praying for Me.